Recent discussion of the pedigree of the Australian supermare Black Caviar focused some attention on Tom Fool, whose son Silly Season is doubled in Black Caviar’s pedigree. Since he was a foal of 1949, Tom Fool will now, to many, mean little more than a name that is found in the more distant removes of modern pedigrees. 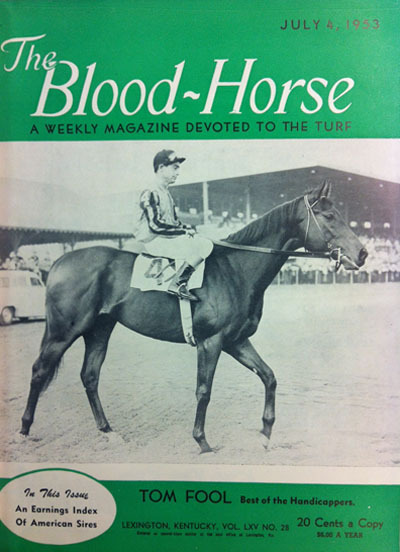 But, if you want to know how good Tom Fool was, consider this: In 1953, Native Dancer – one of racing’s immortals – won nine of ten starts, including the Wood Memorial, Preakness, Belmont, Travers Stakes, and Arlington Classic, but it was not the “Gray Ghost of Sagamore” who captured the Horse of the Year title. That honor instead went to Tom Fool, who was undefeated through a ten-race 4-year-old campaign. Bred by Duval Headley, Tom Fool was by champion 2-year-old Menow (by Pharamond II, a brother to Sickle, the male-line ancestor of Native Dancer and half brother to the great English racehorse and sire Hyperion). His dam, Gaga, was by Bull Dog out of Alpoise (by Equipoise, out of Laughing Queen, a sister to champion 2-year-old colt Pompey), and also produced champion 2-year-old filly Aunt Jinny (by Heliopolis, a son of Hyperion). Tom Fool emulated Aunt Jinny as the leader of his division at 2, taking the Sanford Stakes, Grand Union Hotel Stakes, East View Stakes, and Futurity Stakes. Winter favorite for the classics, Tom Fool won his first start at 3, but then went to the sidelines after he was found to be suffering from a cough and fever following a narrow defeat in the Wood Memorial. Returning to action in the summer, Tom Fool displayed useful, rather than exceptional, form in a spell that ended with a third to One Count in the Travers. Rested a month, Tom Fool finished up his 3-year-old campaign with an impressive six-race run which included victories in the Jerome Handicap, Sysonby Handicap, Grey Lag Handicap (in which he defeated 4-year-old Battlefield, another juvenile champion, meeting the older horse at seven pounds worse than weight-for-age), and the Empire City Gold Cup. Highlights of Tom Fool’s undefeated 4-year-old season included consecutive victories in the Metropolitan, Suburban, Carter, Brooklyn, and Whitney (video) Handicaps. Having carried 136 pounds in the Brooklyn, Tom Fool was kept to weight-for-age contests for the rest of his career, and under those conditions he faced only six horses in his final four starts combined. Unchallenged in those contests, he bade his farewell with a track-record-breaking eight-length victory in the Pimlico Special. As a sire, Tom Fool didn’t succeed in founding a male-line to match that of Native Dancer (through his son Raise a Native). 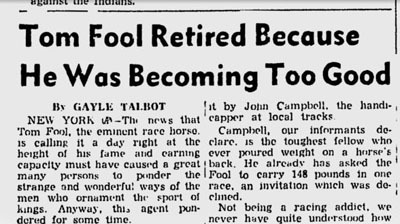 Tom Fool did, however, sire 36 stakes winners from only 275 foals (13% stakes winners to foals), and get one genuinely great horse in Buckpasser, and another extremely good one in Tim Tam, who took the Kentucky Derby and Preakness Stakes before fracturing a sesamoid while finishing second in the Belmont. The best winner out of a Tom Fool mare was champion 2-year-old and Kentucky Derby hero Foolish Pleasure. As far as the U.S. is concerned, the Tom Fool male-line has all but faded from view. Montbrook – by Buckpasser’s son Buckaroo – was a longtime leader of the Florida stallion colony, and for 2012, he’s been joined in the Sunshine State by his son, champion sprinter Big Drama (TrueNicks,SRO). Another son of Buckaroo, the runaway Kentucky Derby winner Spend a Buck, is represented in Kentucky by Brazilian-bred Einstein (BRZ) (TrueNicks,SRO), a four-time grade I-winner with earnings of almost $3 million. Of course, Buckpasser did become an important broodmare sire of sires, including Seeking the Gold, Woodman, Miswaki, Easy Goer, Wavering Monarch, El Gran Senor, Touch Gold (TrueNicks,SRO), Private Account, Slew o’Gold, and Polish Precedent, and he’s also sire of the second dam of A.P. Indy. The strongest branch of Tom Fool’s male line has emerged via some international peregrinations. His best European-raced son was Paul Mellon’s Silly Season, a high-class 2-year-old and eight to ten furlong performer whose successes included the Champion, St. James’s Palace, Dewhurst, Lockinge, and Coventry Stakes. Silly Season would sire 26 stakes winners, including Fair Season, who went to South Africa where he sired champion Jungle Warrior; Martinmas, a useful sire in England; Adios, a group I sire in New Zealand; and Lunchtime. Champion at 2 in England where he won all three of his juvenile starts including the Dewhurst Stakes (gr. I), Lunchtime failed to train on at 3. Sent to Australia, Lunchtime did well as a sire and was responsible for a real star in Snippets, co-champion 2-year-old and champion 3-year-old sprinter. Snippets, in turn, has been an extremely successful speed sire, siring champion 2-year-old filly Hasna, and Pins (AUS) (TrueNicks), an Australian Guineas (gr. I) winner who is one of the best stallions in New Zealand. When we come to Black Caviar, we find that she has Silly Season 5x5, through Adios (sire of the granddam of Black Caviar’s sire Bel Esprit) and Snippets (sire of Scandinavia, the granddam of Black Caviar).